Most recently there has been huge controversy regarding /r/vaporwave, mainly over it’s treatment of popular vaporwave artist 3D Blast. As most of you know, /r/vaporwave is a reddit forum that was pivotal in vaporwave’s early years, helping to both give people a place to talk about vaporwave and spread it throughout the internet. As vaporwave evolved, /r/vaporwave was still around and didn’t get involved in any major controversy though it remained oddly the same in one area, the treatment of vaporwave. To put it shortly, if your music wasn’t slowed down/lo-fi/80s/asian influenced than it wouldn’t make it on /r/vaporwave. A couple of days ago, 3D Blast started a discussion about his treatment by /r/vaporwave; the consistent deletion of his music as well as the silencing of a fundraiser that raised $1,000 for “Toys for Tots”. It got a lot of people taking sides, a lot of people talking until recently when the subreddit mods decided to censor 3D Blast. We have seen a lot of subreddit corruption throughout the history of reddit. People who know what is best for the subreddit, people who hold personal vendettas and abuse their powers to satisfy that vendetta, people who want power for the sake of it and while it has destroyed many great subreddits, it’s naturally a part of the reddit experience. Now if there were more places for people to talk about Vaporwave than this wouldn’t be a problem but it seems like /r/vaporwave is the ONLY source for vaporwave that is easily accessible. Take for instance this screenshot, courtesy of Bandcamp. This may not be a definitive example but it does show that there is an evolution going on that is not constrained to FLORAL SHOPPE type music. You’ve got futurefunk, you’ve got hard vapour, you’ve got ambient music like 2814 and you’ve even got signalwave. I even hate to say it but vaporwave fashion has gotten to a point where people are actively advertising it on Instagram hoping people will buy it and wear it as if it were the trendiest thing there was, clearly vaporwave has become more of a movement and less of a genre as people start to utilize the emotional, corporate and retro ideals of vaporwave in different ways. It has become the rebellion to the commercialization of nostalgia and human life. 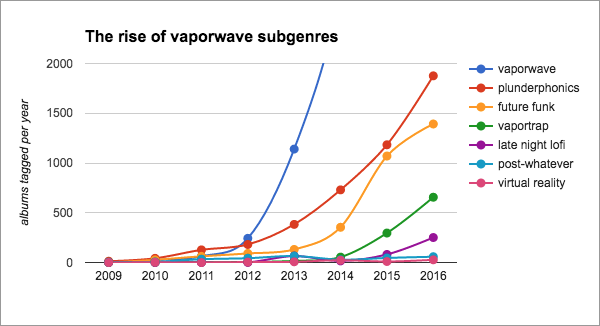 Yet /r/vaporwave continues to live in 2011.
reddit should have seperate subreddits for different subgenres yes, but they shouldn’t be isolated from the vaporwave movement. /r/vaporwave needs to go less monolithic and more into widening it’s horizons and they should do that by loosening the rules, embracing the different subgenres, actually providing people with guides describing what the vaporwave movement is and yes, starting discussion. To censor 3D Blast is similar to what the nazi regime did; squash ideas, discussion and inclusiveness. 3D Blast is a human like the rest of us; so what if he’s not the type of vaporwave you expect him to be, he at least does a lot more for vaporwave than most people do in their entire lifetimes. His music is classifiable as vaporwave and vaporwave is not just FLORAL SHOPPE. So yeah, /r/vaporwave is hampering the movement and the only way to provide change is if you stand for what’s right. 3D Blast, even though he’s bound to face a lot of adversity, is doing just that. I found your comments on Vaporwave fashion to be most interesting. I feel that these pop-up shops on instagram that print out ‘Vapormeme’ shirts are made to appeal to those who are just getting into Vaporwave music. Fashion that is related to a particular music genre almost always appeals to the newest of listeners because they feel that if they are to fit into the group, they must dress the part. Also, I visit the r/vaporwave subreddit quite often and have found that (in my own opinion) ambient-sounding tracks have gotten much more praise than classic-style vaporwave.